Though not all floor tile is created equal, rectified tile actually is. “Equal” in this sense refers to dimensional consistency from one piece of tile to the next. In the firing and drying process of ceramic and porcelain tile, variations typically occur in the length and width of each finished piece. These deviations occur due to reactions between the primary ingredients in all ceramic tiles—sand, clay and feldspar. It’s little bit like baking biscuits in an oven: some come out smaller, others slightly larger, and the exact final size is difficult to control. While the behavior of ceramic tile material in a kiln is certainly more predictable than biscuit dough, nevertheless, after the firing and cooling process slight size deviation among individual tiles in a batch is inevitable. After firing in a kiln and then cooling, rectified tiles get additional attention: precision cutting and grinding to exact horizontal dimensions with all four vertical sides also forming a perfect 90-degree angle. The process involves use of diamond saws and grinders that produce tiles sized to highly exact tolerances on all four sides. Typically, a visual comparison of rectified tiles will reveal no noticeable variance at all in the size between individual tiles. The vertical sides of each tile are also exactly horizontal with the exception of a minute, imperceptible bevel along the top of each side to prevent chipping once the tiles are installed in the floor. Installation of rectified tiles allows grout lines much narrower than the standard width and as thin as less than 1/8-inch. Grout lines of minimum width are very inconspicuous to the eye and provide the impression of a seamless expanse of tile stretching across the floor, particularly when the grout is appropriately color-matched to the tile. In most cases, the grout utilized is a non-sand variety specially formulated to fill very sleek lines. Another benefit of razor-thin grout lines is familiar to anyone who maintains floors: wide grout lines between tiles tend to collect grime and discolor conspicuously, requiring more labor-intensive procedures to clean and keep clean. Of course, opting for rectified tiles also raises certain other questions that must be cleared up before making the choice. What size tiles do you want? Generally speaking, rectified tiles are available only in large format—a size not much smaller than approximately 12 inches by 12 inches. If the specific tile pattern or design you’re seeking isn’t available in that size or larger, you won’t be able to get a rectified variety. Will special installation techniques be required? The answer is a definite yes. Because rectified tiles are so close together and separated by tiny grout lines, any variance in height between each tile is more conspicuous than standard tiles with wide grouting. This means the base beneath rectified tiles needs to be uniformly level. Special bedding or precisely level substrate may need to be installed before laying the tile to achieve an exact, horizontally flush appearance between tiles. 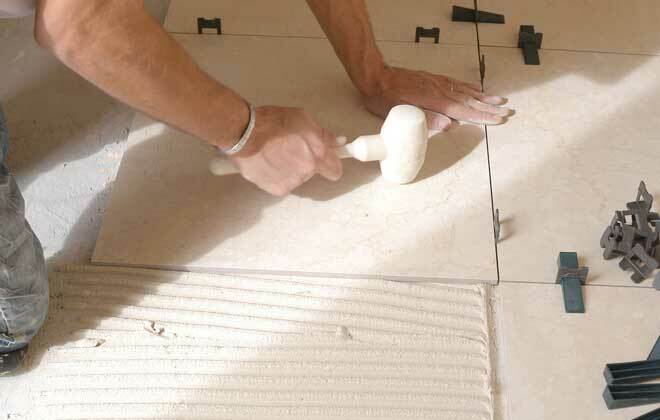 Are your contractor and installers well-versed in the procedure to install rectified tiles? Non-rectified tiles with wide grout lines have been the industry standard for many years. Consequently, not all flooring installers are trained and experienced in the procedure of laying rectified tile—particularly the precision required to create very narrow grout lines. Verify in advance that the contractor understands your expectations and has the skills and track record installing rectified tile to do the job right. Ideally, have your specific requirements written into the contract. Is that tile really rectified? Unfortunately, not all tile marketed as “rectified” actually meets the specifications to earn that designation. Some so-called rectified tile isn’t produced to more exact tolerances than standard tile. Ask and verify that any tile you’re considering meets the more stringent rectified specs published by the American National Standard Specification for Ceramic Tile to ensure you’re really getting true rectified tile. Are you prepared to pay more? The extra processing involved in production of genuine rectified tiles—and the more painstaking, precise installation techniques—necessarily imposes a higher price compared standard tiles. The cost differential isn’t enormous, however, it is a factor that must be considered to avoid surprises. The growing popularity of rectified tile flooring is not likely to be a passing style that will soon fade. The seamless appearance is naturally appealing to the eye and provides a refreshingly different visual impression than the “grid” look of conventional tile with wide grout lines. While it isn’t the right choice for all installations, and cost and installation are important factors that must be taken into consideration, rectified tile floors are here to stay.